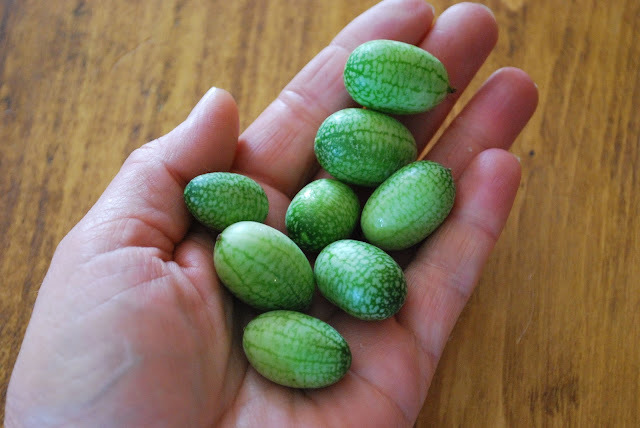 our Uncity life: Mexican Gherkins aka "Watermelon Cucumber"
Mexican Gherkins aka "Watermelon Cucumber"
Other nicknames: mouse melon, cucamelon, sandita, Mexican sour cucumber, Mexican sour gherkin, Mexican miniature watermelon. And trust me, these really ARE miniature! They are about 1" to 2" when ripe, about the size of grapes. Small perhaps, but utterly adorable. 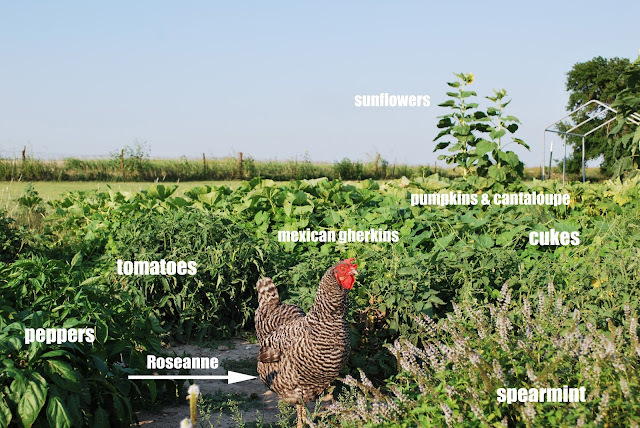 Delicious to eat right off the vine. The taste is commonly described as cucumber with a citrus finish. These are perfect as salad toppers, and can also be pickled. A friend at work gave me 3 starter plants. With all the rain we've had this year, those 3 little plants took off like crazy. I wish I would have given them a taller support to climb - as it is, I only put a foot high border fence in the garden for them to wrap their little tendrils around, so now they are spreading out in all directions, intermingling with the other cucumber plants and pumpkins. I highly recommend planting some of these in your garden next year, if only for the cute factor! Susan, thanks for the report! I had them on my pinterest - plenty early, before Spring, but did I order any seed? Nope! Next year I will. Love your pics, as always.. and your beautiful Roseanne! -Tammy p.s. y'all Kansans kept that rain all to yourselves.. lol.. it keeps piddling out before it gets to MO!